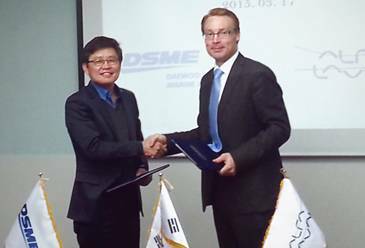 Alfa Laval has entered into a patent license agreement with Daewoo Shipbuilding & Marine Engineering (DSME) for the use of DSME’s patents on high pressure fuel gas supply systems. The agreement signed in March 2015 enables Alfa Laval to further develop the Alfa Laval Fuel Conditioning Modules for use with high pressure gas injection engine technology from MAN Diesel & Turbo. The agreement will see Alfa Laval use DSME patents with Alfa Laval Fuel Conditioning Modules for use on natural gas-powered ships, such as LNG carriers. The agreement also paves the way for Alfa Laval to adapt its fuel conditioning systems using DSME technology to use LNG as secondary or tertiary fuels aboard commercial ships of the future. The DSME license agreement for Alfa Laval LNG-based Fuel Conditioning Modules and the acquisition of CorHex heat exchangers further enhances Alfa Laval’s already extensive LNG portfolio, which includes inert gas generators, gas combustion units, burners, boilers and heat exchangers.